The Buffalo Bills are obviously looking to draft a quarterback this year and they would love to be able to select one of the so-called big four signal callers come April 26th. Their trade with the Cincinnati Bengals last week sending tackle Cordy Glenn to the Bengals for a swap in first round picks was made partially with the idea of being able to move into the top five to grab one of those quarterbacks. The Bills swapped the 21st pick for the twelfth pick in that trade, and with all the picks they have in this draft, they are in position to move into the top five. The New York Jets at least put a temporary stop to that idea by trading with the Indianapolis Colts for the third overall pick. What hurt the Bills in that trade was now they can’t get to three and the price the Jets paid set the market this year to move up in the Draft. Using the points chart, the Jets paid about a 440 point premium to make that trade. For the Bills to get to either two or four to select one of the top quarterbacks they would have to pay a ransom. Also, the New York Giants and Cleveland Browns may not want to move out of the two or four slot. When you look at the big picture, that is something that may not benefit the Bills in the long term. The alternative is to not move up and draft one of the quarterbacks in the next tier of players at the position. Right now that looks like the best thing for the Bills to do. 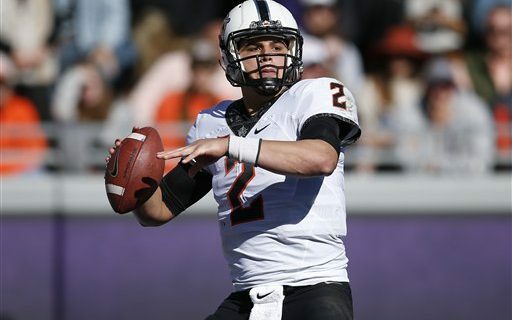 With that in mind, let’s take a look at one of the quarterbacks they could be looking at and that is Oklahoma State’s Mason Rudolph. Rudolph has prototypical NFL quarterback size at 6′ 4.5″ & 235 lbs. He is certainly not the best athlete of the group, with 4.90 speed, but he has quick feet and he can keep a play alive in the pocket with his feet. Looking at Rudolph’s career, he has been ultra-productive, passing for 13,618 yards and 92 touchdowns. In the last two seasons he has passed for just under 10,000 yards and 65 touchdowns while throwing only 13 interceptions. When compared to the other quarterbacks, Rudolph’s intangibles may be the best of any quarterback this year. He has a very strong work ethic, is well liked and respected by both his coaches and teammates and he is an excellent leader. On the negative side, Rudolph is not a threat to run and he isn’t going to make many plays with his feet and he has seldom played from under center. Also after a very strong start this year, his play leveled off some the last part of the season. Overall, Rudolph has been a starter since late in his freshman year and has been one of the most productive quarterbacks in the nation. He has the physical tools to excel at the NFL level. As with most college spread quarterbacks, he will need time to adjust to NFL style offenses. While his physical tools are good, it’s the intangibles that put him over the top. He should become a starter by year two and he will become a winning NFL quarterback. There is no one who can prove to me that he doesn’t have as good a chance to succeed in the NFL as any of the big four quarterbacks. In fact his chance to succeed might be even better because he won’t have the pressure of being a top five selection in the Draft! Greg Gabriel on later round QB’s who could interest the Bills, and his scouting report on Josh Allen.